Rus­sell Stan­dish has been work­ing on Min­sky thanks to the extra funds raised by the donate but­ton below. A large num­ber of bug fixes. We’re delighted that Source­Forge has seen fit to make Min­sky it’s Project of the Month. Min­sky is both a gen­eral pur­pose sys­tem dynam­ics pro­gram, and the first such pro­gram specif­i­cally designed to sup­port the build­ing of mon­e­tary mod­els of the econ­omy. Our design objec­tive has been to make it as intu­itive as pos­si­ble to use, while sup­port­ing var­i­ous advanced features–such as main­tain­ing con­sis­tency between mul­ti­ple mon­e­tary flow tables–in as seam­less a way as pos­si­ble. We hope that users will find it use­ful, and we would be delighted to get cod­ing assis­tance from devel­op­ers, user assis­tance in bug test­ing and build­ing the help sys­tem, etc. Dr. Rus­sell Stan­dish and I have been work­ing on Min­sky now for almost two years now–first using a $125K from INET’s Spring 2011 grant round and then another $80K from a suc­cess­ful Kick­starter cam­paign: Rus­sell as builder (cod­ing in C++ and Tcl/Tk) and me as archi­tect (play­ing with each release, spot­ting bugs and sug­gest­ing fea­tures). It’s been a part-time endeavor: Rus­sell, as a con­tract pro­gram­mer, has to keep more than one iron in the fire, while I have a fair few balls in the air myself. Rus­sell has put in about 2000 hours of cod­ing over that time. That amount of cod­ing is chicken feed com­pared to the mil­lions of hours that have gone into a stan­dard com­mer­cial prod­uct like Microsoft Word or Excel, so Min­sky is still rough at the edges, and lacks a num­ber of fea­tures that you would expect in a com­mer­cial pack­age. But there is enough core func­tion­al­ity and sta­bil­ity in place for a first major release–the “Mun” ver­sion which can now be down­loaded from Source­Forge (major iter­a­tions of Min­sky are named after major thinkers in economics–we started with Aris­to­tle). There is still only a rudi­men­tary and incom­plete Help file (did I say I had too many balls in the air? ), so to make up for it I’ve recorded the fol­low­ing set of 15 videos that cover most of the fea­tures of the pro­gram. They’re all up on YouTube (where the num­ber is the series changes from 8 to 11 to 15…), but here they are for easy ref­er­ence, with some notes about what each video cov­ers. All the Min­sky (mky) files used in the pre­sen­ta­tions are in this Zip file. So if you’re into eco­nomic mod­el­ing and you’d like to develop dynamic mon­e­tary mod­els, Min­sky now has enough fea­tures to be worth using–and it won’t face the lim­i­ta­tions that apply to more con­ven­tional sys­tem dynam­ics pro­grams, like Stella, Ven­sim, Vis­sim, etc., that make it inher­ently chal­leng­ing to model the finan­cial sys­tem. With Min­sky and its God­ley Tables, mon­e­tary mod­el­ing is a cinch (and it will get eas­ier as we add more capa­bil­i­ties to the pro­gram). So please, down­load the pro­gram, join our beta-test­ing group, and start build­ing mon­e­tary macro­eco­nom­ics. Installing Min­sky from a ZIP file, the can­vas, wiring to build equa­tions, installing a graph, graph­ing a basic func­tion like sin(t), out­putting the equa­tions to LaTeX (which you can import into MathType in Word), and a basic “endoge­nous money” God­ley Table. Min­sky Files: sine.mky (using Min­sky to plot a sine wave); Godley.mky (a basic purely mon­e­tary model, with no simulation–just the dou­ble-entry book­keep­ing table). Using a God­ley Table to define a numer­i­cal sim­u­la­tion: right-click to copy flows and vari­ables (“stocks”), defin­ing mon­e­tary equa­tions, and run­ning a sim­u­la­tion. 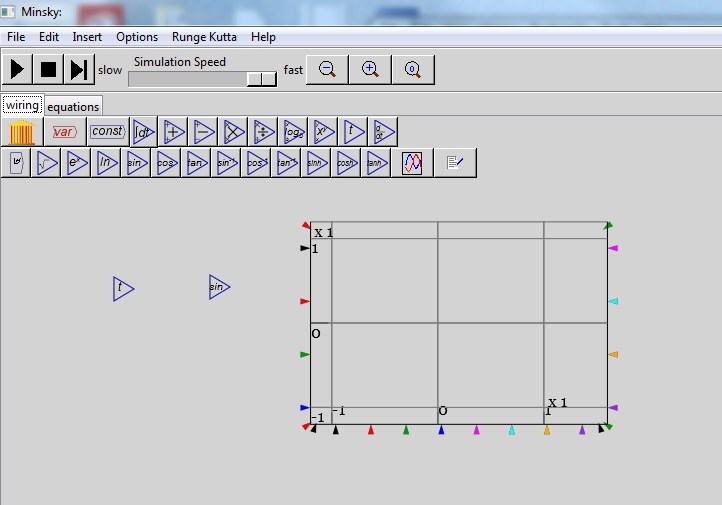 Min­sky file: GodleySim01.mky (the same model as in the pre­vi­ous video with def­i­n­i­tions of flows added so that it can be numer­i­cally sim­u­lated). Using time lags, enter­ing Greek char­ac­ters and sub­scripts, build­ing a dynamic model using the flow­chart part of the pro­gram, using inte­gra­tion blocks in dynamic mod­els, mak­ing x-y graphs as well as graphs of vari­ables against time. Start­ing to inte­grate a mon­e­tary and a phys­i­cal model, using slid­ers to vary para­me­ters dur­ing a sim­u­la­tion. Doing it right: start­ing by mod­i­fy­ing the real cycli­cal model to include mon­e­tary vari­ables. Min­sky files: God­ley­Good­win­Sim­Int01C (adding Price to the Good­win model before attempt­ing the inte­gra­tion). Min­sky files include God­ley­Good­win­Sim­Int03, where I add a lin­ear invest­ment func­tion to the lin­ear wage change func­tion that is the core of the Good­win model. 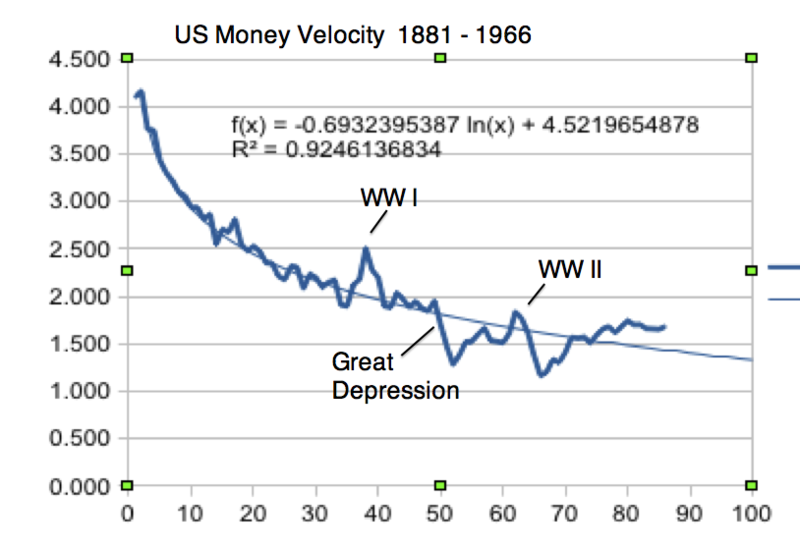 Get­ting cycles in the mon­e­tary econ­omy as well as the phys­i­cal. Intro­duc­ing an invest­ment func­tion as well as a wage change func­tion. Show­ing the debt-defla­tion model. Com­bin­ing MMT and MCT with two God­ley Tables, one for the Cen­tral Bank, the other for Pri­vate Banks. Minsky’s built-in logic to main­tain con­sis­tency between assets and lia­bil­i­ties across mul­ti­ple God­ley Tables. A poten­tially sur­pris­ing result about the rela­tion­ship between the change in pri­vate debt and the change in pub­lic debt. Min­sky files: Min­sky­One­PointZe­roDe­mo09­Mul­ti­ple­God­leyTa­bles (com­bines MMT and MCT and shows that the change in pri­vate debt and the change in pub­lic debt are not of equal and oppo­site mag­ni­tudes in a closed econ­omy). Group­ing enti­ties, zoom­ing in to see a group, edit­ing a group, using the Lorenz Strange Attrac­tor as first exam­ple, and my model of debt-defla­tion as the sec­ond. Bugs and how to cope with them. Using the flow­chart side of the pro­gram to build the famous Lorenz model. Chang­ing the Runge-Kutta para­me­ters to get a smoother sim­u­la­tion. Set­ting ranges on a graph. Using slid­ers to vary para­me­ters in a model while it runs. Min­sky files: Vari­a­tions on Lorenz, espe­cially Loren­zWith­Slid­er­s02. How does Min­sky stack up as a sys­tem dynam­ics pro­gram com­pared to the estab­lished play­ers Simulink, Ven­sim, and Vis­sim? 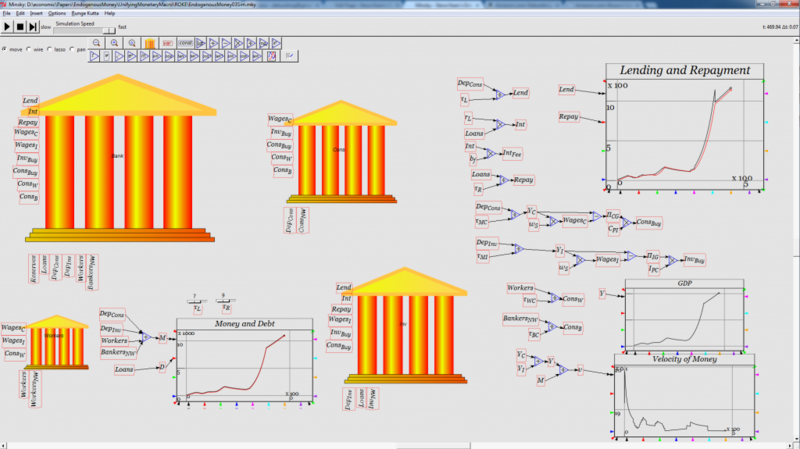 It doesn’t have the power of these estab­lished pro­grams of course–matching the fea­ture set of even Ven­sim would require tens thou­sands more hours of pro­gram­ming time, let alone that of Vis­sim or the mar­ket leader Simulink. 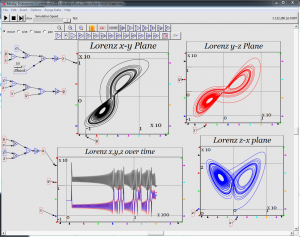 But on a user-friend­li­ness scale, I think it’s easy to see that Min­sky is much eas­ier to use than Ven­sim, sig­nif­i­cantly eas­ier than Simulink, and within reach of Vissim–though it lacks some basic edit­ing fea­tures. Minsky 1.0 Demo #15 Why Godley Tables? This is the clincher. If you want to model mon­e­tary dynam­ics, there is no other pro­gram that offers any­thing like the God­ley Table for mod­el­ing the dou­ble-entry flows that char­ac­ter­ize the finan­cial sys­tem. A flow­chart is an inher­ently weak tool for build­ing a mon­e­tary model..
Hello guys, kind of new here. Can any­body help me, how to down­load Min­sky? I’ve played around with QED and the first Min­sky ver­sion from source­forge, but I’m unable to get the recent ver­sion. I’m also about to post a set of videos on how to use it, and a call for beta testers. Lovely to have your help on that already! @Steve and Char­lotte: I just down­loaded both the ver­sion in the “Min­sky for Win­dows link, and the one linked to in your Aug 9 post. They are both named Min­sky 1.0 D099, and both pro­duce the error men­tioned by Char­lotte. Look­ing for­ward to user doc­u­men­ta­tion, and also docs for the mky xml file for­mat. I will be happy to be involved in beta test­ing. I did a quick search, but can’t see whether your par­tic­u­lar issue has been reported or fixed, though. As for beta test­ing, I should have a new build for beta test­ing next week, but you need to sub­scribe to the beta testers mail­ing list to get noti­fi­ca­tion of new builds for test­ing. Start­ing next month, I will be work­ing on for­mal­is­ing the mky for­mat as an XML DTD. This is impor­tant, as the exist­ing for­mat is imped­ing the program’s evo­lu­tion. The descrip­tions will be checked into the source code repos­i­tory, and posted to the Min­sky wiki. As for user doc­u­men­ta­tion, the idea is for the soft­ware to be quite intu­itive. Feed­back on fail­ings in this regard will be appre­ci­ated! More impor­tant doc­u­men­ta­tion is more a ped­a­gog­i­cal one, show­ing how to cre­ate eco­nomic and other mod­els in Min­sky. Steve’s videos are a good start. I’m puz­zled by the spec­i­fi­ca­tion of stock vari­ables, which are gen­er­ated when col­umn head­ings of the God­ley Table are named. Stock vari­ables don’t have input ports. 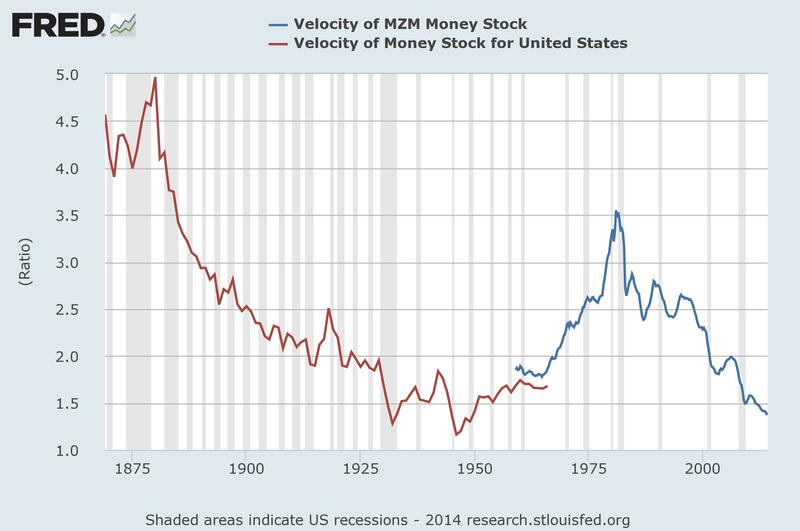 How are stock lev­els replen­ished? By mak­ing row entries Gra­ham. Add an entry for loans from the bank to a bor­rower for exam­ple, or check some of the sam­ple files. A more recent ver­sion of Min­sky is avail­able from Source­Forge. Cur­rently, the released ver­sion is 1.D9, also known as “Aris­to­tle”. Any word on what’s hap­pened to this? I mean… take my money already. Addi­tion­ally, will you put out an email when the cam­paign opens? At the moment I intend launch­ing the cam­paign on Mon­day next week–January 28. I had planned to start ear­lier but–to put it mildly–I have had some dis­trac­tions recently. I have some work to do on the cam­paign, which I hope to do in the morn­ings next week before attend­ing the Aus­tralian Open dur­ing the after­noons and evenings this week. I should get them done in time for a Mon­day launch. And I will def­i­nitely email, blog and twit­ter about it when it goes live! Hey Steve you might want to update this post. Hello, unfor­tu­nately I missed the Kick­starter cam­paign. Please advise how to con­tribute after the fact if pos­si­ble. Since when did you start using Veloc­ity of Money? I thought that was anath­ema to a Key­ne­sian. Hi there, I am a bit con­fused as I have down­loaded one ver­sion from Source­forge and one which I was guided to as the lat­est beta ver­sion. I have really tried hard to go through the exam­ples with Pro­fes­sor Keen but the ver­sions I have are very dif­fer­ent from the one he is using and I have no idea where to find some of the func­tion­al­ity. The first one I down­loaded didn’t seem to have have wires, which seems quite impor­tant. The sec­ond one didn’t have many of the func­tion but­tons (eg sin or t) and also didn’t have any export to LaTex func­tion­al­ity. Is there a ver­sion that I can use that is the same as Pro­fes­sor Keen’s? Sorry, I’m prob­a­bly being com­pletely dumb here. But it says 1.D34 on it when I click the link you put (this is the ver­sion I have). And it’s prob­a­bly com­pletely fine, but I can’t find where the wires/move/lasso/pan radio but­ton option is that you use to pick the wire option. I attach what mine looks like. Apolo­gies for my prob­a­ble being dumb. Is there any­one who can help me? I would really like to get started but need to know where the wires are on ver­sion 1.D34. I have looked every­where (the caveat being that I am not very good at look­ing for things). As shown on the screen­grab, they are not where they are in the demon­stra­tion.